Today, I would like to show you another rice dish with SOBA-CHA (Buckwheat Grain), mixed with Sushi Rice! I prepared some steamed Rice (Short Grain White Rice) with SOBA-CHA (Buckwheat Grain), and then mixed in a little Vinegar mixture with some White Sesame Seed to make a more flavorful Sushi Rice. Then I added some tuna with some vegetables into this roll. 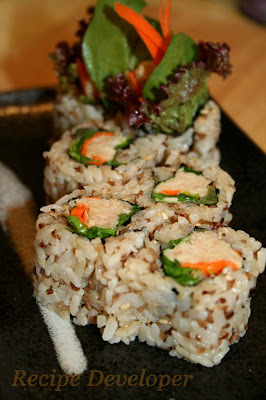 The fragrance the rice gave the roll, along with all the different textures made this new roll a re-freshing flavor from regular Sushi Rice or Brown Rice. I've introduced a few dishes using some SOBA-CHA (Buckwheat Grain) dishes, now let's talk about the nutritional value of this tasty grain. Buckwheat is the best known grain of it's source for a high protein score. And this nutritious grain can help lower your cholesterol level, lower blood pressure, while keeping your blood flowing smooth. Personally, I believe that eating Buckwheat often can help to prevent cancer and heart disease. Please do not try to use too much Soy Sauce, you can enjoy your Sushi much better, while at the same time eating more healther!